The Indian-owned carmaker is leading the charge for British manufacturing. Britain as a nation is very pessimistic about its manufacturing sector. A survey last year by manufacturers’ association EEF found that almost three quarters of us believe, wrongly, that the UK made more goods in the 1980s than we do today. The truth is that there are still plenty of businesses out there creating real jobs, making things and exporting them. One of these is Jaguar Land Rover (JLR). Though it’s now owned by the Indian conglomerate Tata, JLR employs more than 30,000 people in the UK and is growing fast. Today it announced it’s set to take on 1,300 new staff at its Solihull plant, who will work on a new Jaguar ‘crossover’ SUV model, a 4x4 based on its C-X17 concept car. 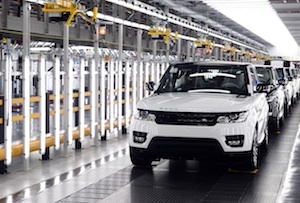 ‘Today's announcements once again demonstrate our commitment to the UK and the advancement of a high-tech, high skilled, manufacturing-led economy,’ said JLR CEO Dr Ralf Speth. The news caps off a strong year for the business - sales by volume in 2014 were up 9% to 462,678 vehicles. 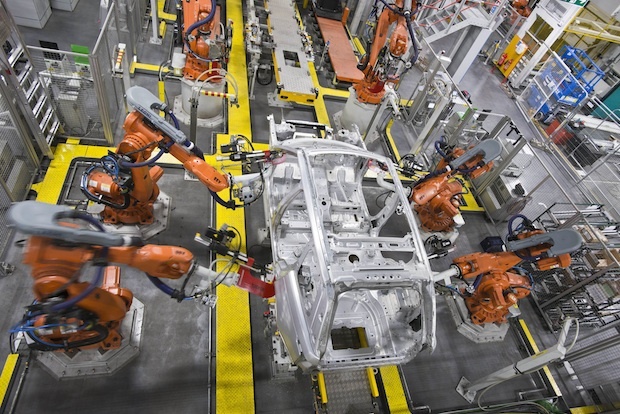 JLR has already invested £1.5bn in production of lightweight aluminium technology at its Solihull plant, where 9,450 staff work in a body shop and assembly hall the size of 22 football pitches. The business has also been looking to expand its international presence after opening its first overseas factory in Chengshu, China, last year and beginning construction of another in Brazil. Sales in China jumped by 28% last year. Politicians are always happy to take the credit, but it's certainly true that the automotive sector is a strong example of where British manufacturing can shine.